Vinpower has long been known as an innovator in the field of optical disc duplication, especially with our market leading autoloader duplicators. Recently, Vinpower acquired the rights, designs and material of the Dexpreso Company, which manufactured the DEX1000 automatic CD/DVD burner. Overall, this system was a decent loader and was adopted by a number of brands in the market. However, it had its flaws and never became as popular as it could have been. When Dexpreso decided to close its doors, Vinpower recognized the merits of the tiny loader and acquired all rights. After modifying the mechanics and implementing our own burning software, the new VDX-1 CD/DVD/Blu-ray Autoloader will soon be re-launched into the market for 2015. With an extremely aggressive price point and a light portable frame, the VDX-1 is sure to be a hit amongst light to medium duplicators that would benefit from an automated device. 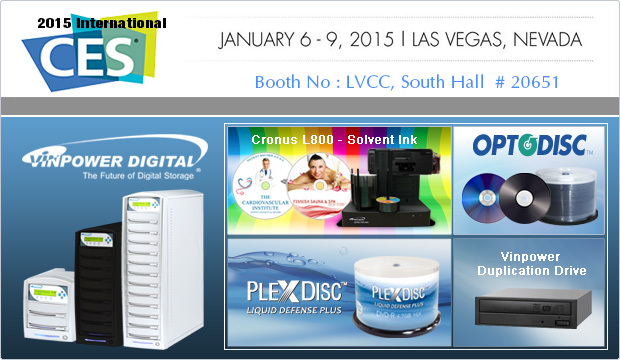 Be the first to see the VDX-1 in action at the CES trade show in Las Vegas, January 6 â€“ 9, 2015, South Hall 1 Booth # 20651. The start of a new calendar year symbolizes the rebirth, especially for the electronics Industry with the arrival of CES (Consumer Electronic Show), which takes place in Las Vegas, NV from Tuesday, January 6 through Friday, January 9, 2015. 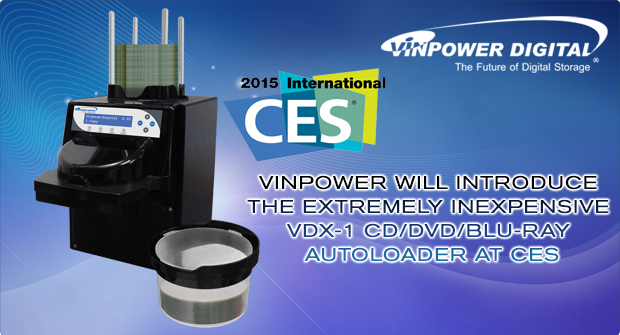 Once again, Vinpower will be exhibiting at CES in the South Hall 1st level, space # 20651. We will be exhibiting some exciting new product lines that we have recently finalized. However, in order to be among the first to witness these incredible new products, youâ€™ll have to visit us at CES and see them for yourself. Vinpower is very excited about these new offerings and think they will be very popular. Therefore, if you plan to attend the show, please contact us to make an appointment to visit our booth. If you cannot make it, stay tuned for future announcements from Vinpower! 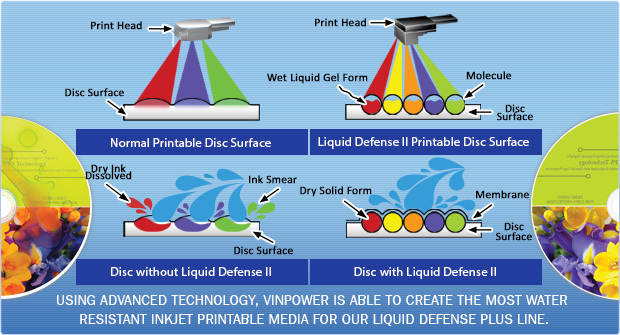 Using advanced technology, Vinpower is able to create the most water resistant inkjet printable media for our Liquid Defense Plus line. Inkjet printing is still the primary print method for labeling optical discs. Even though the printers can apply photo quality artwork, if the discs are just standard inkjet printable media, the actual printed image is not protected and can easily smear, fade, or bleed. The best way to prevent that is by using the Vinpower line of Liquid Defense Plus media, available in CD, DVD and Blu-ray, which uses special nano-particle molecular technology to seal in the ink and prevent moisture or other factors to disrupt the image. As the image shows, the nano-particle molecular technology prevents the ink from separating and holds it in place, regardless of the amount of water or moisture that comes in contact with it. So if you really care about the look and longevity of your printed media, Vinpowerâ€™s Liquid Defense Plus is the best solution for you! Contact a Vinpower representative today for more details.